Lytle: I used to have allergy problems, and I’ve suffered slightly from insomnia. Right now, I have this full-on arsenal: a cup of NyQuil, Breathe Right nasal strips, ear plugs and I’m sleeping on a Tempur-Pedic bed. 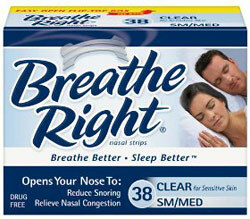 I’m attempting this sensory-deprivation state of sleep with the Breathe Rights as my ace in the hole. I’ve thought about getting nasal surgery, but I can get 30 years’ worth of Breathe Rights for the money it would take to have the operation. And there’s no guarantee with surgery. You could end up with a mono-nostril.